A golf-club carrying Skyline GT-R that can run to 300+ km/h! Runs to over 300 km/h - proven! When it’s the done thing to bolt on huge turbochargers and invest in exotic engine internals, it’s easy to underrate anything that’s not as extreme. But let’s get our feet back on the ground - a relatively small number of mods can transform a car into something that, in real-world driving conditions, is almost as quick as the all-out monsters. 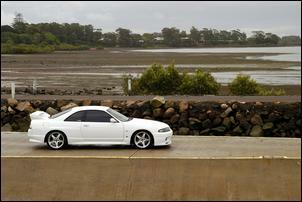 Just take Chris William’s Nissan R33 Skyline GT-R as an example. It mightn’t be the wildest GT-R, but we can tell you its damn quick and is genuinely driven. 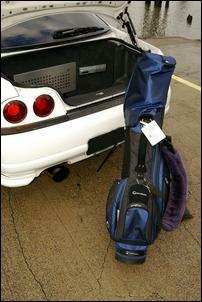 And, to demonstrate its practical usefulness, it also happens to cart a set of golf clubs in the boot! Chris handed over the cash for his R33 GT-R after growing tired of his previous ride - a mid 12-second Holden V8 ute with a 150hp nitrous kit. 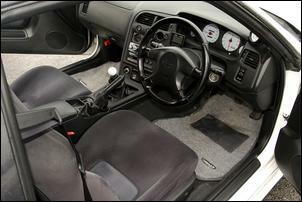 The Japanese supercar appealed because it enabled Chris to drive fast around corners – not just in a straight line. 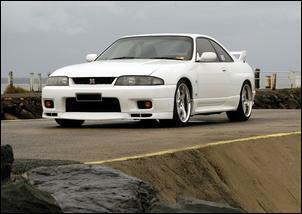 Certainly, the R33 GT-R was the perfect machine to satisfy Chris’ growing enthusiasm for circuit racing. This particular GT-R arrived from Japan with most of the mechanical configuration already sorted. The factory fitted 2.6-litre DOHC twin-turbo (RB26DETT) was equipped with an A’PEXi 3 inch exhaust and dual air filter system. The standard ceramic turbine turbochargers (which are notorious for failing at increased engine output) had also been replaced with steel wheeled jobs. These twin turbochargers pump the in-line six with up to 1.1 Bar of boost in normal conditions and up to 1.4 Bar when toluene is added to the tank. 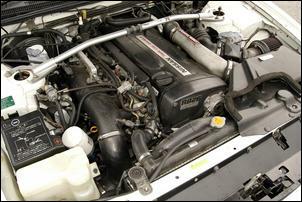 The standard intercooler remains - why change it when it’s performing perfectly well? 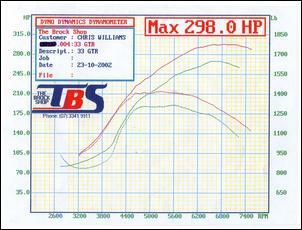 The tweaked RB26DETT is tuned using an A’PEXi Power FC plug-in programmable ECU. This drives the standard direct-fire ignition and factory injectors teamed with a Sard pressure regulator and pump. To ensure the engine runs sweetly when pushing those high speeds, Chris has added an Earl’s oil cooler with a remote oil filter kit. Chris says this has reduced the maximum oil temperature from 135 to 105 degrees Celsius (as indicated on the factory oil temp gauge). 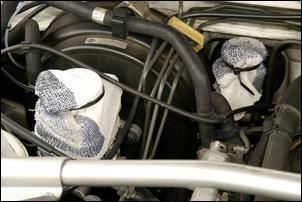 As seen in this photo, Chris has also cable-tied socks over the header tank for the power steering, brake and clutch master cylinders – these are a preventative step to eliminate the chance of fluid seepage while on the racetrack. Chris has beefed up the driveline with an OS Gikken twin-plate clutch while the rest of the active AWD system remains unaltered aside from a C’s short-shifter. Handling is seriously improved with Tein coil-overs, Tein castor rods and front and rear camber kits (currently set to around 1 - 1 ½ degrees neg at each corner). 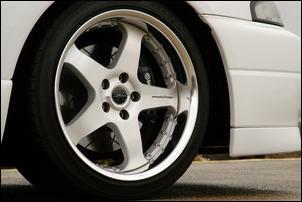 The standard R33 Brembo calipers team with custom slotted versions of the factory discs. High-performance pads, ADR-approved braided stainless lines and a master cylinder brace improve stopping power, consistency and feel. The immaculately presented car looks magnificent with its Works 18 inch rims wearing Firenza ST03 265/35 tyres, which we’re told are adequate for the street but can’t quite cut it on the track. Chris says one of the most dramatic on-road improvements came from revising the adjustment of the coil-overs and wheel alignment. The handling is now described by Chris as ‘"#%^&ing awesome." Inside, the cabin is kept neat and useable. Chris has added a 320 km/h Nizmo instrument cluster, an A’PEXi turbo timer, Razo white gear knob, boost gauge and a big - but not over-the-top - sound system. At the head of the sound system is an Alpine flip-face CD feeding MB Quart front splits and there are standard rear deck speakers teamed with an unusual 11 inch Focal Utopia sub-woofer. It’s all driven by a Xtant amp which lives in the boot; Chris has made sure there’s j-u-s-t enough remaining boot space to swallow his beloved set of golf clubs. You never know when you’ll get the urge to sink a few balls!